Buyers can choose betweenthree TFSI gasoline and three TDI diesel engines producing between 63 kW (86hp) and 136 kW (185 hp). Audi pairs some engines with the lightning-fast, seven-speed S tronic transmission. The lightweight body lays the groundwork for the low gross weight – the A1Sportback 1.2 TFSI tips the scales at just 1,065 kilograms (2,347.92 lb). The body is also very rigid and impact-resistant yet quiet on the road. 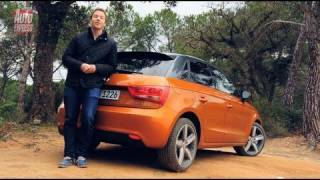 The product of these strengths is the outstanding driving sensation of the compact Audi. Sportily precise and free of vibrations and intrusive noise, it is reminiscent of cars from a larger class. 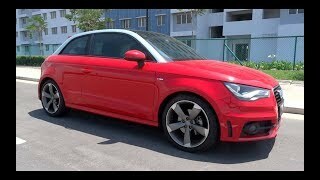 The Audi A1 Sportback is available with a choice of six four-cylinder engines: three TFSI and three TDI units. All of the engines follow the downsizing principle – they substitute forced induction for displacement and draw their fuel through direct injection units. All versions except the 1.6 TDI with Stronic and the most powerful gasoline engine are equipped with a start-stop system. Three TDI units round out the lineup. The 1.6-liter engine is available in two different versions, with 66 kW (90 hp) and 77 kW (105hp). When paired with a manual transmission, both versions consume just 3.8 liters of fuel per 100 km (61.90 US mpg) on average, which corresponds to only 99 grams of CO2/km (159.33 g/mile). The 105 kW (143 hp) 2.0 TDI to follow later accelerates the A1 Sportback to 100 km/h (62.14 mph) in 8.5 seconds, yet its average fuel consumption is just 4.1 liters of fuel per 100 km (57.37 US mpg). The transmission also underscores the high-tech character of the A1 Sportback and its special position in the compact segment. Audi offers the seven-speed Stronic as an option with the 1.4 TFSI with 90 kW (122 hp) and 1.6 TDI with 66 kW (90 hp); it comes standard with the top TFSI model with 136 kW (185 hp). The dual-clutch transmission shifts comfortably, extremely quickly and with no perceptible interruption to the flow of power. The two clutches do not need a separate oil supply, making the S tronic even more efficient.